We know from first-hand experience—having guided hundreds of victims through their ordeals—just how scary and debilitating motorcycle accidents can be. Our thoughts go out to anyone and everyone who has had to deal with the trying aftermath of even minor collisions. Sad to say, few motorcycle accidents can be called “minor collisions.” Most motorcycle wrecks will result in serious injuries and even loss of life. Over the past decade, the Houston area has seen its fair share of motorcycle accidents. 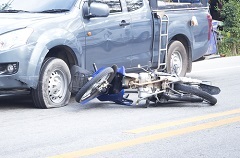 Some of these accidents were caused by negligent drivers of four-wheel vehicles, some were caused by other motorcyclists, and some were the result of victims themselves losing control of their bikes. Unfortunately, even though the causes varied, the outcomes remained the same—severe damages, excruciating injuries, and deaths. Remember, these statistics are limited to motorcycle accidents that took place in, and only in, Texas. It’s sadly safe to say that any injury you may sustain from a motorcycle collision is going to require treatment. In many cases, your road to recovery may not only be painful but also tediously long and expensive. The good news is that a successful personal injury claim can help you recover costs and get you back on track—but only if your claim is successful. A personal injury settlement can provide compensation for medical bills, ongoing recovery costs, lost wages (missed work), and even the very real instances of emotional pain and suffering. However, your settlement depends on the willingness of the insurance company to pay, and the insurance companies fighting on the other side of these lawsuits do not play around. They’re willing to use every trick and tactic in the book to ensure that you get paid as little as possible. They may say that they care about you and your family, but the truth is that they only care about their own bottom lines. This is why you need to confide in someone you can trust to guide you through the twists, turns, and bumps the insurance company will lay at your feet. That someone is attorney Steve Lee. Despite the severity of a motorcycle accident, time is not a luxury you can afford to lose. If you believe you may have a personal injury claim against a negligent driver, whether he was on a bike or in a car, it is imperative that you act quickly to collect evidence and preserve your legal rights. An experienced lawyer will take your suit forward and ensure that you avoid the obstacles that so many other people hit. Attorney Steve Lee has been dedicated to serving motorcycle accident victims like you for over 35 years. He knows your concerns, he knows your rights, and he knows the law. Help is available 24 hours a day and the initial consultation is always FREE. We’re also able to provide transportation options as well as home and hospital visits. Contact us today at 713-921-4171 or 1-800-232-3711 and let us show you how to navigate the claim process to preserve your rights and get your future back on track.